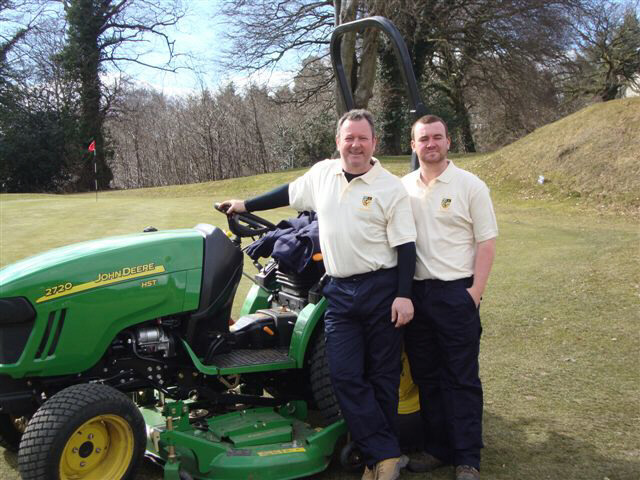 Blackwoood Golf Club – Groundsmen are really green! Blackwood golfclub is beautiful course in the hills of South Wales and my brother in law John, is the secretary. We thought that this was a great opportunity for a golf club to be “really green” by their groundsmen wearing ethically soursed uniform. 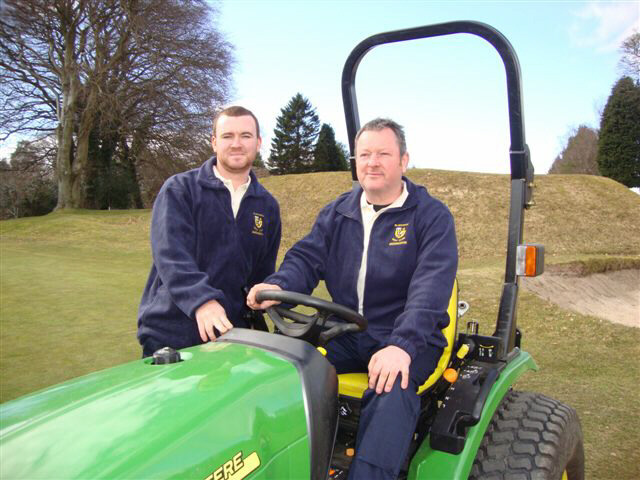 The two groundsmen are a father and son team of Alan and Owain Hughes who look after the course all year round. We supplied them with jackets made from recycled plasic bottles and polshirts which are cerified as both organic and Fairtrade. Here they are in the photographs wearing their new “green” uniform. I enjoyed this project, I think it’s great that a golf club decided to choose ethical clothing for their uniform. I hope more clubs follow suit……thank you Owain, Alan and of course John. I visited India to spend some time with the people who grow the cotton for our Fairtrade Polo shirts and T shirts for schools. It started out as an adventure and was fascinating from the moment we touched down in Ahmedabad. There were two highlights. The first was a surprise. 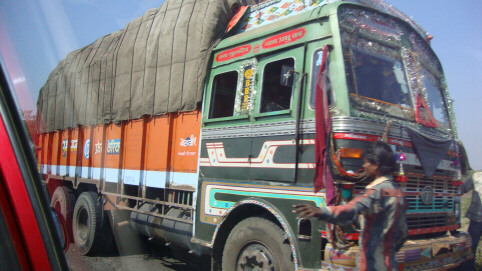 We were talking to spinners at the large Mahima Factory when they hurried us along. We were told to hurry or the children would have already gone home. Puzzled we did indeed hurry. 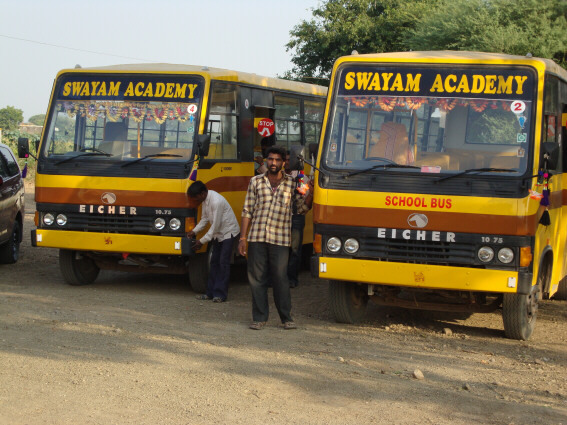 We were whisked away and taken to the Swayan Academy. We were able to briefly visit each class. 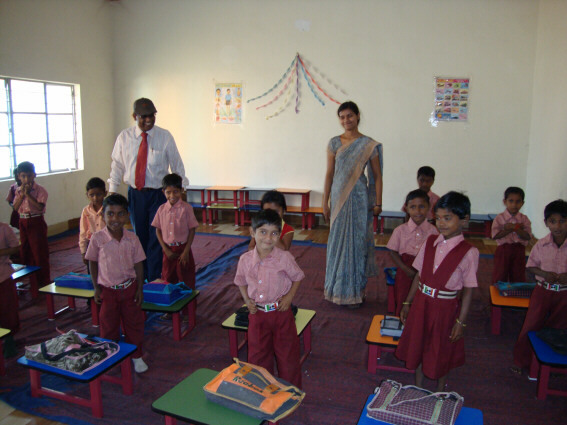 The children were predominantly from families who would not normally be able to send their children to school. 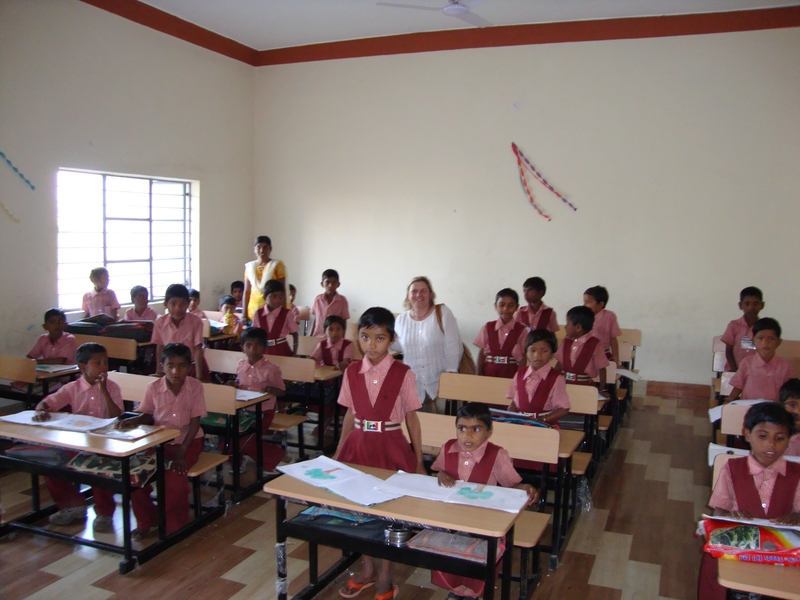 The pupils were from the rural cotton growing communities and the school was supported by Mahima Purespun. The children were so polite, seemed a little in awe, but clearly happy. It was one of those moments in life that I will remember. As we left the school we both looked at each other and said that the whole trip was worth that one visit. The knowledge that by manufacturing Fairtrade and organic school uniform we were directly in the circle that contributed to this school and their future. Next we squeezed again into the car and were taken by mostly bumpy tracks to a cotton farm co-operative. We had no idea what to expect and had been told the harvest had taken place. I will wite about that experience in my next blog. Good news again! We seem to be going through a purple patch of good news. YeHa! 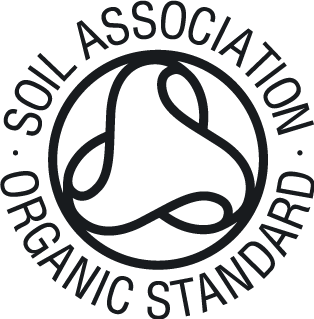 We have been in touch with the Soil Association and we think we can be the first “UK t shirt embroiderers to be certified as organic. Whoopee. Helen is on the case and looking into the auditing we would need to do. I have to say that the Soil Association has been so helpful and positive. We already have so many things in place I am hopeful so watch this space as we work towards the certification. I will update the blog as we progress through the certification, the ups and downs, and try and give tips based on our experience for anyone else inerested in gaining certification. This is Lisa – our sales manager. You can see she is a very serious person and grabs any opportunity to sit down and mess about! 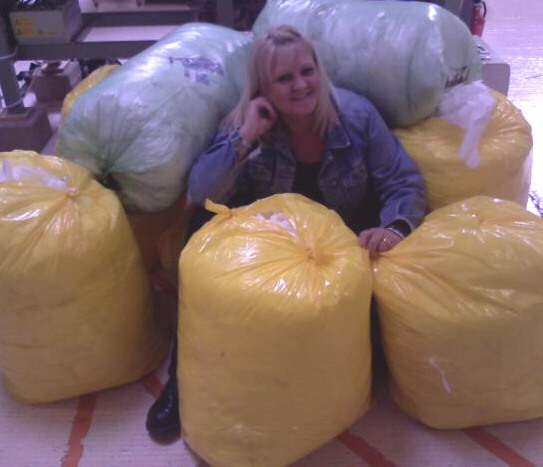 We have been saving the waste vialene, (the stuff we use behind the embroidery to hold the fabric firmly) especially for a local charity – close to the heart of Milton Keynes people. Willen Hospice does wonderful work and is very highly thought of. We were really pleased when we found that our vialene can be reused for cloth manufacture and the proceeds go to the hospice. We need a good home for all the polybags we now collect. If you have any suggestions please let me know. Karen and Ros have been diligently saving the Vialene and now here is Lisa taking the opportunity for a sit down in comfort! Ahhhhh….. 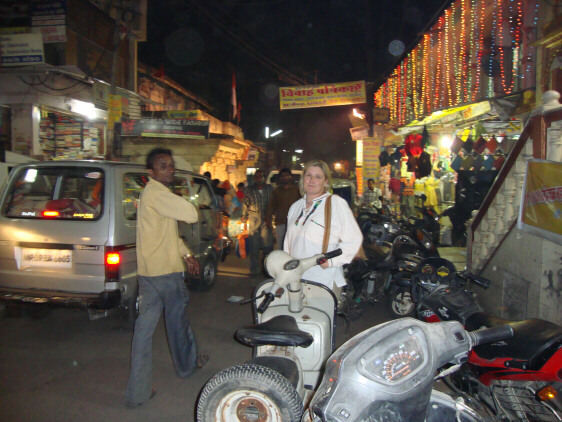 I travelled to India to visit some of the people we talk to often, and work with, but have never met. My sister Sian came with me and after a lot of last minute excited planning we set off. We flew to Ahmedabad in northern India in the state of Gujarat. We had lots of advice such as…….. look very confident, arrange a car to pick us up from the airport, clean your teeth in bottled water, the traffic and noise will be enormous, the poverty will hit you. But nothing prepared us for the experience. It really was not a cliché to say it was another world. But what an exciting world. We had a wonderful, life changing time. We stayed at first in a modern hotel which had great facilities with helpful courteous staff. The Lemon Tree Hotel. It was very western in appearance although the food was of course Indian and excellent. Maybe it was because we were two women travelling alone, or maybe our age (not young), or that we were very “fair” Europeans, but what ever the reason we caused so much interest wherever we went. Throughout our entire trip the outstanding memory I have is the kindness, interest and friendliness of the people we met. This was without exception. At first I was like a child. I walked to the gates of the hotel and took a little brave step out onto the pavement. Just for a minute. The traffic, the horns, the camels pulling carts, the rickshaw drivers and all in a mad, mad swirl of hubbub and noise. Because we were not in a tourist area we got the full impact of a busy, intent, city with people at work. I went back inside the hotel. I have travelled to many countries Canada, Argentina, America, and many European destinations but nothing like this wonderful scary intriguing India. The guidebooks said Ahmedabad was dirty, noisy with not much reason to visit. The guidebooks were wrong, it was daunting but we would not have changed it for the world. Head of production making our morning tea. Karen our head of production, our guru, who can answer all questions relating to thread, embroidery, and designs is a shiny star of our team. 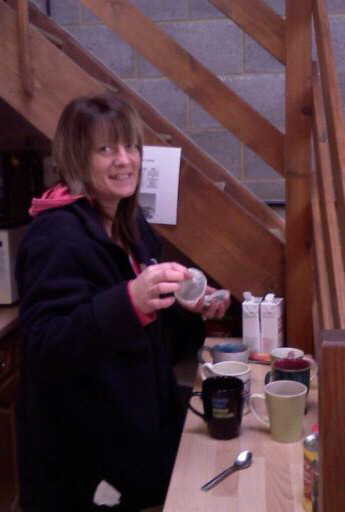 Exceptionally thoughtful, here she is making our “lets start the day” cup of tea! Fairtrade of course. Yum. School uniforms making children ill? Here we are again thinking and learning. I have had a number of telephone calls recently from parents worried about the school uniform their child has to wear made from polyester/cotton mix. The polyester content has irritated the skin of the children. Cotton is a naturally “breathable” fabric and is much kinder to the skin for both adults and children. I certainly prefer cotton and wear it myself. I then stumbled across the following article in “Wales online”. Wales is my homeland and I enjoy keeping up with the news. The article comments on the chemicals often applied to fabric to make it especially easy to care for. It is sometimes called anti wrinkle or Teflon coated. Perfluorinated compounds are added during manufacture and the World Wildlife Fund are worried about the effect of this man-made chemical on wild life. 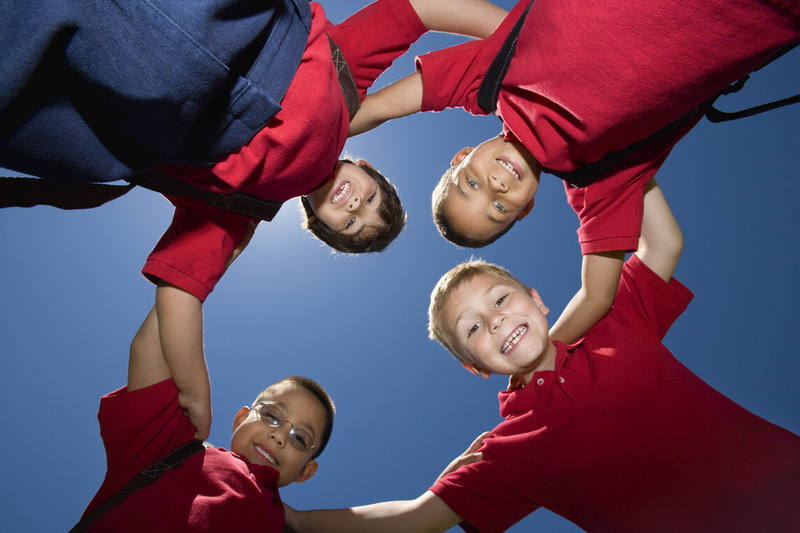 It’s a really thought provoking article – School uniforms making children ill? Many schools choose polyester mix fabrics so that the garments can be washed very easily. However the arguments for “just cotton” are significant, breathable, kind to the skin, wash at lower temperatures and if you add the Fairtade cotton as an extra reason then I think the decision should be a wise one. 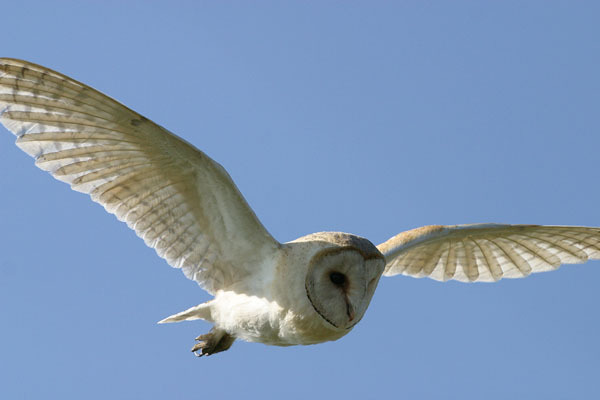 By the way on my way home form work Wednesday a magical barn owl accompanied me for about 200 yards. It made me wonder………..what do I need to make wise choices about in my life at the moment. Dig deep Susan. But that’s for another day. Well we have great news. I am pleased. Very. We are about to introduce School uniform which is Fairtrade certified! Hurrah. To start with white, red and sky blue polo shirts, white t shirts, navy and red sweatshirts. As more schools ask for more colours we will add them to the range. Helen, Lisa, Natalie Jenny and I have been thinking about this for a while. We already supply many schools with uniform and it seemed such an obvious idea to offer a Fairtrade option. Of course nothing is that simple – I wish it was! Supply, quality, reliability and stock holding, all need to be thought through. But here we are about to launch. 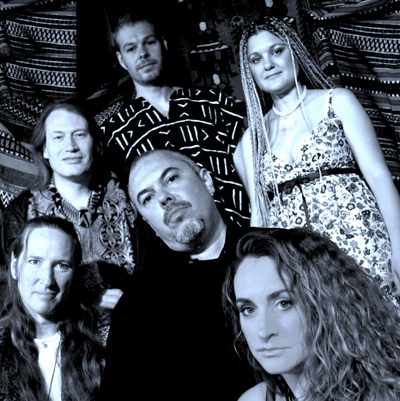 The wonderful band Solstice performed at The Pitz in Milton Keynes on Saturday. They have reformed after many years of branching out individually as musicians. I had seen a DVD of them performing at the Cropredy Festival many years ago and thought they were superb. Last weekend something made me dig it out and play it to a friend – and then of course rave about it. Hey presto two days later a get an e-mail from Andy telling me all about the re launch and their new CD Spirit. Synchronicity or what! While we were in India we were surprised and very, very pleased to be featured in an issue of Business & Economy magazine. We are featured along with a few other companies as “the latest brewing in ethical fashion”. Well we are flattered to be included in fashion although most of the garments we sell are very straightforward – for example organic t shirts. The company clothing industry on the whole requires good quality, colour fast garments which will fit a range of employees. I believe if we were too fashionable e.g. figure hugging t shirts we would not meet our customers requirements. The question I ask every week, or even more often is “Are the enough customers who want to consider sustainability, social responsibility and fairness for Cotton Roots to be sustainable?” Impact Trading (my original company) still supports Cotton Roots but every order we get for Fairtrade polo shirts, every new customer who commits to the ethical options we offer, gives me a thrill. Really! Most recently Chester Zoo has started to purchase from us their staff uniforms. They now have organic trousers and Fairtrade aprons. We are hopeful that when our new bottle green, Fairtrade and organic polo shirts arrive that the zoo also change to these garments. On a visit to Chester Zoo recently with Helen we met Brendan who made us most welcome and showed us around. 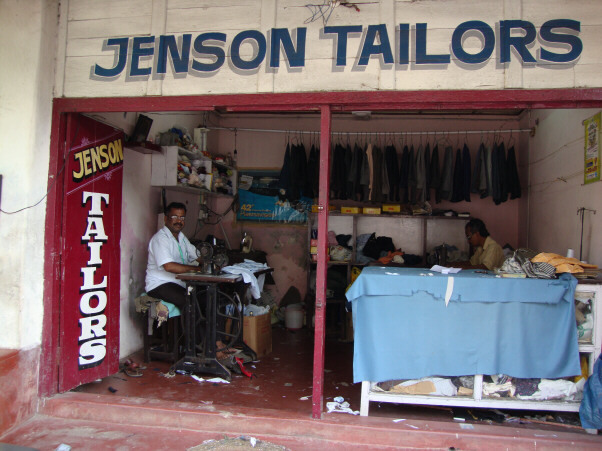 They are so committed to ethical sourcing generally which includes food, water and now uniforms. I was impressed. www.chesterzoo.org Helen is in discussion with a number of other zoos so watch this space for more news.